We are committed to building upon the success of the past by maintaining an ongoing quality assurance program. By undertaking new initiatives we will strengthen our ability to compete in an increasingly competitive and complex marketplace. 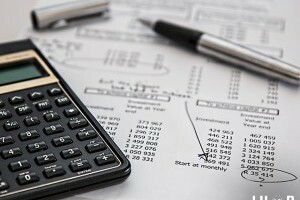 As our customers place increasing emphasis on curtailing the escalating cost of doing business, we devote more of our time to understanding the needs of our customers and then develop auctions that directly address those identified needs. A phone call to our home office, or one of our convenient branches, is all it takes to get the wheels in motion. One of our representatives will set up an appointment to meet with you and your staff to review the unique requirements for your specific sale. At that time, we will explain in detail, the services that will be provided for you to bring top dollar for your equipment. In order to achieve a highly successful sale, Alex Lyon & Son will do all the necessary research well in advance. Then you will be provided with a thorough proposal explaining everything in writing and an approximate figure of what a successful auction should generate in gross sales. Due to our experience in heavy construction equipment auctions, we know which matters need to be discussed up front ­ before the sale is confirmed. So, you can rest assured that all points will be covered. From then on, all we need is your faith and trust in our long-standing reputation. Once all terms of the auction have been agreed upon, the Lyon professionals will proceed with the planning stages of your sale. Lyons wants to provide as much coverage of your sale as possible. Our Advertising Department will begin a national advertising campaign in trade magazines, newspapers, and our own website, providing the highlights of your auction. When we receive your detailed listing of equipment, we'll categorize it, and begin to "build" your sale, by entering each item into our sophisticated database, which uploads to our website nightly. 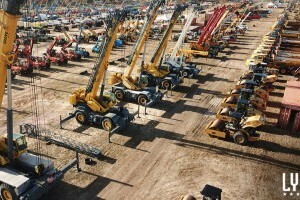 Here, potential buyers will be able to view the machinery and watch the auction as it "grows". About three weeks before your auction, we'll design a colorful brochure, similar to the ones shown here, which lists details and presents photos of your equipment. This brochure is sent out to our network of 40,000 interested buyers. Plus, all Lyon brochures include an Upcoming Auction calendar, so you'll get exposure of your sale even before your own colorful brochure is mailed out. On the day of the sale, auction catalogs are made available. All equipment will be listed according to the order in which they will be put up for auction. Our complete attention is focused directly on your company until all the homework is done. Our staff will be in constant contact with you. 7-10 days prior to the sale we will arrive on site and layout all tools and equipment in a proper sales order. Each and every lot will be numbered, tagged and cataloged. Our accounting secretaries will arrive a few days before the sale to work with your people on all transfers of titles pertaining to your vehicles. In many cases, the machinery being sold needs special attention prior to the auction. Sandblasting and painting of machines, along with good rubber, makes a big difference in the price to be received. Lyon’s can recommend professional painters who can make your equipment look cosmetically as good as it did when you purchased it new. Believe it or not, auction day for the seller is headache-free! 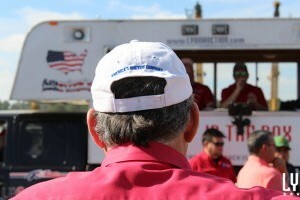 A successful auction is similar to a contractor doing a successful job. If all the homework is done in advance, auction day gently rolls on. Lyon¹s people arrive at the crack of dawn on auction day to handle the many facets of the operation. Yardmen are there early, making sure all of the equipment is running properly for the preview. Auctioneers and ringmen are there early too, assisting potential buyers with their questions or concerns. The clerk and cashiers will be properly registering all potential buyers, while ascertaining that all customers understand the terms and conditions of the sale. Food concession people are on the scene to make sure no one goes hungry. Security is there for obvious reasons. 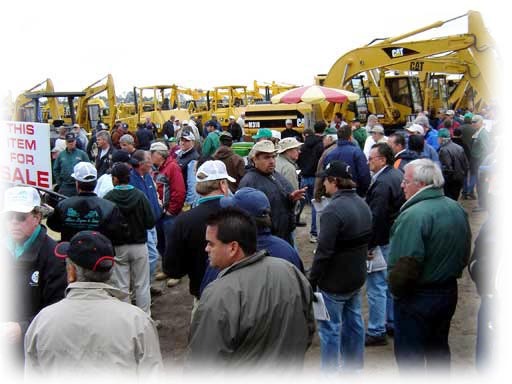 Prior to the start of the sale, all attendees will receive a sale-day catalog, listing all equipment to be presented. Once the auction is in progress, our yard people and mechanics make sure that all equipment and shop tools are properly loaded out. At the completion of the sale, Lyon¹s secretaries balance the auction, and the owner receives a preliminary tally of the day. Lyon¹s yardmen are left behind so that the equipment sold can be loaded out in an orderly manner. Traditionally, at the end of an auction, the owner has turned his assets into cash and is appreciative for the commitments the Lyon¹s Team has made. 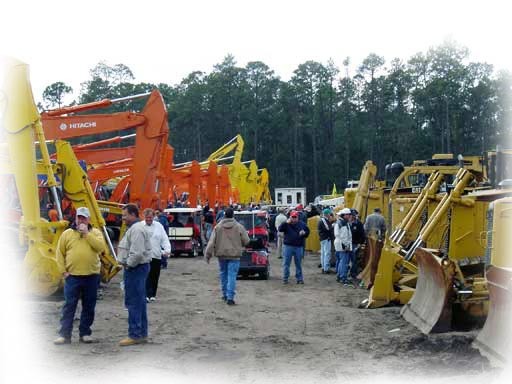 We are professionals in the used heavy equipment auction business. Therefore, as your sale comes to a close, we hope that we will have formed a firm relationship with you and your company. We look forward to being of service to you again.